Take your dog with you wherever you go! 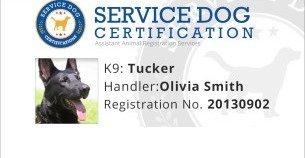 Service Dog Registration - Service Dog Certification and Identification cards for handlers. Service Dog Certification, Vests and Harness are not required, but help to identify your Service Dog. Service dogs and emotional support animals are protected under federal law. Stay informed. Register your service dog, emotional support dog, or therapy dog. Your assistance animal, service dog, emotional support animal (ESA), therapy animal, etc. will be placed in a database for you to retrieve from your smartphone, tablet, or laptop. If you prefer, you may order a card from us and we will deliver it to you via mail. If your order is time sensitive, we have expedited digital and physical delivery options available. With our certification and registration process, we provide a privacy service that eliminates the need to disclose your disabilities to strangers. Although service dog certifications are not mandatory by federal law, Service Dog Certifications wants to empower those in need of mental, emotional, and/or physical support from our animals. Register your animal in our Service Dog Registry and get your service dog, emotional support dog, and therapy dog identification to eliminate doubt and preserve your rights.